I would like to see death and dying becoming integrated into life as the natural life event that it is. Often death is seen as the feared spectre at the end of life that nobody wants to talk about. Birth, life and death all belong to the same fabric, the threads of each experience weave between one another. We, as a society need to learn to wear these threads with comfort. Doctors and the medical world have death well covered with’Care Plans, Pain Control’and more. What is lacking though is’Soul Preparation’ I mean, do you book a holiday without preparing for it, for example: what to take? How to travel? Who you take with you? What will you wear? We equally if given the time beforehand, would find it truly beneficial to do some ‘Soul preparation’. Thoughts like this are what led me to create the Embracing Dying course. 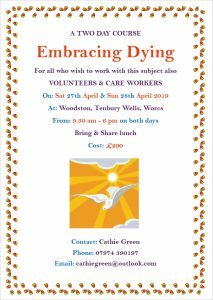 It is a course for everyone, whether you are caring for your loved one at the close of their life, or if you have just been given a terminal diagnosis yourself, or have heard that someone you know be they your neighbour, friend, colleague, if indeed you want to feel you can help, when dying becomes a part of your life experience. People often think that they will not be confident to care for someone who is dying. Fear and uncertainty stop them even thinking that they could truly offer a helpful contribution. Why not I ask you, if death is a natural part of life?